George Burr had early art instruction from his mother, and when he was ten, moved with his family to Cameron, Missouri, where his father bought a hardware store. The young George began experimenting early with etching techniques and then studied for three months at the Art Institute of Chicago, his only formal training. In 1890, he became an itinerant illustrator for Harper’s and Leslie’s Weekly, and also did a commission of 1000 pen-and-ink- drawings for a Metropolitan Museum catalog of a bronze and jade collection owned by Heber R. Bishop. The money he made from this and other Bishop commissions allowed him to travel in Europe for four years, and he did hundreds of sketches there. In search of a better climate for his health, he moved to Denver in 1906, but he and his wife spent their winters in the deserts of New Mexico, Southern California, and Arizona. 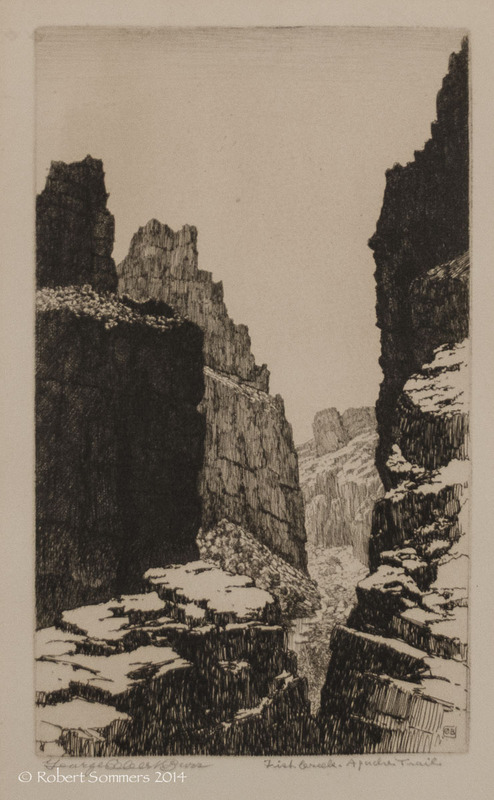 From these travels, he did his most famous etchings, a series called “Desert Set.” He settled in Phoenix in 1924, and lived there until his death in 1939 at age eighty.